Details: Alpine West Ski School has partnered with GLM Charters to pick up children at Eastgate Elementary School on Wednesdays at 1:30. Ski lessons are at the Summit at Snoqualmie for 90 minutes of ski lessons and then drop them back at Eastgate Elementary between 6-7pm. Program runs Jan 10th – Feb 14th! Cost: $300 for ski lessons, $279 for discounted LTD ski pass/age 7-12 (discounted UNL ski pass $309). LTD pass is essentially the same as the regular season pass except that you cannot ski at Alpental on weekends (unless your child is an advanced skier, he/she will ski primarily at Summit West/Central). Bus ride and ski lessons will be canceled if there are no chaperones to accompany the students for that week. Please consider signing up by clicking on the SignUp Genius logo to the right! Bus ride and lift tickets are provided! Please make sure your children have their ski gear prior to the first day of ski lessons (January 10). Gear rental will NOT be allowed at Snoqualmie. Where will equipment will be stored? Does my child need to bring their ski gear to school every Wednesday? There is a dedicated storage space for the ski equipment at school, so kids should bring their gear when they come in the morning. Skis, boots, hats, gloves, ski clothes, helmet, snack and water bottle must be dropped off every Wednesday morning in a clearly labeled ski bag (all individual skis must be labeled) in the gym storage closet and will be brought home at the end of ski school. No ski poles please. Where will they get dressed with ski clothes? Children must be able to put on their ski clothes and ski boots by themselves. Children will get dressed into their ski clothes at school and ride the bus in their ski clothes. The children will be gone for several hours. Will they have a chance to eat a snack? Should my child pack a snack or does the ski school provide a snack and/or hot chocolate and water? Children are encouraged to bring a snack (nothing messy) and a water bottle (all clearly labeled). Will there be a space where my child can leave their backpack and lunchbox at school while skiing? No, all of the children's belongings will go with them on the bus. 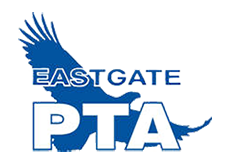 Please email programs@eastgatepta.org with any questions!